HE series are state-of-the-art, Vertical, Hydraulic, PLC Controlled Four Post Transfer Moulding Machines (5 to 300 tons). 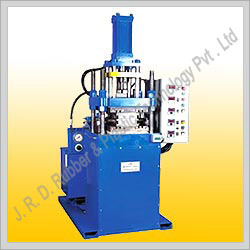 JRD offers a complete line of Pneumatic & Hydraulic Transfer presses with choice of pot & plunger sizes. 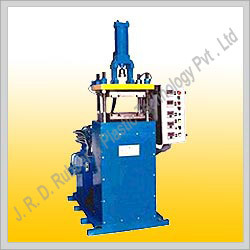 These presses are based on advance U.S designs, offering customers proven machines at economical Indian prices. The precision four post construction of these presses offer rigidity, platen level and parallelism. 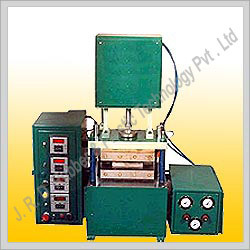 These transfer moulding machines and transfer moulding presses are used for precise moulding of rubber & rubber to metal bonded parts, encapsulated electronics, medical products, insert moulded connectors etc. and many other applications. 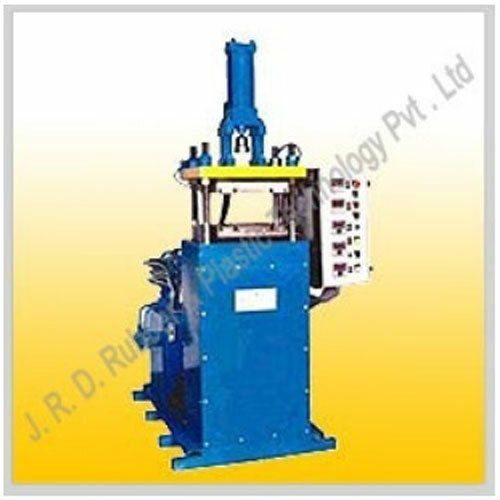 The Injection/Transfer Moulding machines are also termed as plunger based injection where rubber compound is fed into heated transfer pot(s) and the plungers inject the rubber into the cavitites of mould through sprues, gates & runner systems provided in the mould. The Transfer Moulding offers a cost economical alternative to expensive screw machines. Platen Size: 12" x 12" to 30" x 30"
Manifold based hydraulics which reduces the piping & leakage potential. The hydraulic components are easily accessible for quick maintenance. The advance hydraulics on the machine provide for mould safety circuit to protect expensive tooling from damage. Single & Dual Pot/Plunger Configuration. Touch Screen or MMI based controls. Safety Guards and access doors. HEC series are state-of-the-art, Vertical, Hydraulic, PLC Controlled 'C' Frame Transfer Moulding Machines (25 & 50 tons). These C frame presses are fitted with exclusive deflection protection which assures perfect partingline parallelism. They are designed with a 'C' frame type clamp for unobstructed loading of inserts or extrusions and ease of removing moulded parts. The open side clamp allows work pieces to extend to right and left of machine for moulding or encapsulation. These presses are ideal for moulding corners of weather strippings/profiles, gaskets, insert moulded objects & other hard to handle inserts. They are also used for precision moulding of encapsulated electronics, medical products, insert moulded plugs & connectors and many other applications. 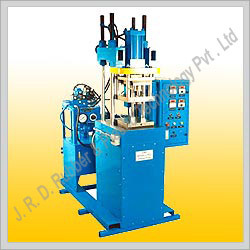 25 ton, C Frame Transfer Moulding Machine with double pot & plunger . Ideal for clean room use (no hydraulics) and quiet operation. Moulding Machines (5 & 10 tons). These are simple to install & operate. The 5 ton, E5 model is placed on top of a bench whereas the 10 ton, E10 is floor based. Both the models are highly energy efficient, clean and silencer equipped for quiet operation. They are well proven in production and laboratory environment. They are ideal for rubber insert, moulding and encapsulation of small electonic components, medical parts and epoxies, silicones and other thermosets. They are also used for material flow tests. Platen Size: 10" x 11" & to 12" x 12"
5 ton, Bench Top, Pneumatic Transfer Moulding Machine. 10 ton, Pneumatic Transfer Moulding Machine.